Motorists preparing to travel for Thanksgiving have something to be thankful for: falling gas prices. According to GasBuddy, prices in 44 of the 50 U.S. states are lower than a week ago, coming just in time for when millions of Americans will be hitting the road. 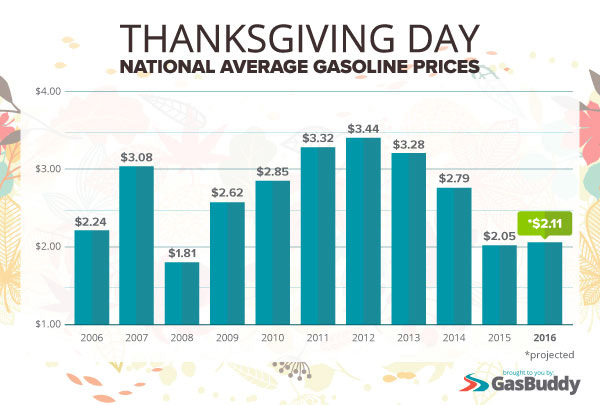 GasBuddy projects the national average gas price this Thanksgiving will be the third lowest in over a decade at $2.11 per gallon. Average prices have only been lower for Thanksgiving in 2015 ($2.05) and 2008 ($1.81). Monday’s national average price for a gallon of gasoline was $2.14, some 65 cents less than the average price on Thanksgiving merely two years ago ($2.79). In Cedar Springs, gas was $2.11 Tuesday. Consumers are taking advantage. According to GasBuddy’s 2016 Thanksgiving Travel survey, 52 percent of those traveling this year will be on the road for at least 4 hours; 20 percent of which will be driving 10-plus hours. The survey also found that “running out of gas” is the third biggest fear when it comes to being on the road for the holidays this year, ranked behind 1) sitting in traffic and 2) needing to use the restroom but unsure where/when the next one will be available. Additionally, travelers are on a mission. Fifty-five percent said they only make stops when absolutely necessary. When they do make stops, gas prices and location are the top deciding factors, followed by the cleanliness of the gas station convenience store.